Traveling nurses and therapists are needed nationwide. This results in extreme flexibility and ability to individualize almost every last detail! In this post, I will discuss the common travel assignment length, settings, types of travel careers as well as provide you with answers to some of the most common questions regarding travel assignments. 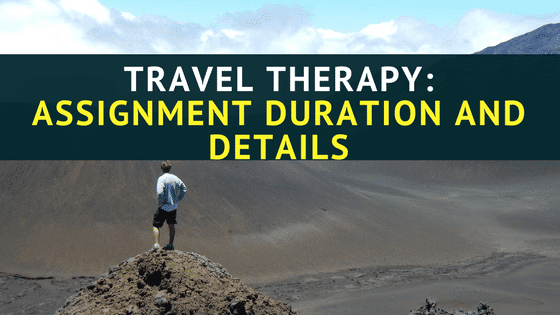 Travel therapy and nursing assignments are usually between 4-26 weeks; however the majority of positions are 13 weeks. After these 13 weeks, you may have the option to sign again for additional time at your current assignment. There is also a risk that your contract may be shortened, however many facilities are required to give 2 weeks’ notice. During this time, travelers can work with their recruiter to find a new assignment. On the opposite side, you may even be offered to sign on to a permanent position. I was offered that twice during my traveling career! Travel assignments can be nationwide. There is such a demand for more healthcare workers, that nearly every state and city need travelers. However, if you have a desired location that does not have any assignments then it is highly likely that within a 50 mile radius there will be positions. In addition, if there are no positions, you can always ask your recruiter to call and look into opening positions for you. For example, I was working with the travel agency Cross Country, and I wanted to go home to Bakersfield, California for an assignment. They did not have any positons but my recruiter spent several days calling facilities and eventually one position opened up! A travel nurse or therapist has the freedom to select assignments with the best pay or locations with the best activities or sites! Think the rolling hills of Alaska, the mountains of Colorado or the beaches of California! Travel positions are often available in a variety of settings including acute care, acute rehabilitation, subacute rehabilitation, and outpatient to name a few. Hospitals and subacute rehabilitation centers tend to have more needs, usually due to the size of their facility, but it may vary. Do I need to be licensed in each state I work? Yes. Each state requires its own licensing. The good news is that most travel therapy and nursing agencies help you obtain the required license before your start date. License processing can take 8 or more weeks so it is important to plan ahead and give yourself several months to travel in a new state. You also want to make sure you meet all your license requirements with each new license. Do I need any special certification or education to do travel therapy? No, to enroll in a travel agency you only need a clear background, CPR certified, 1 year of experience, and your professional license. However, certain assignments may require special certifications. For example, an ICU unit may want special ICU certifications for their nurses. What are the experience requirements to become a travel therapist or nurse? Usually 1 year is required to do traveling, however this requirement is flexible. Some positions offer mentorship for new graduates while other facilities may want 2 years of experience as therapist or nurse. When I sign on with a company, will I be locked into working with this company? No. 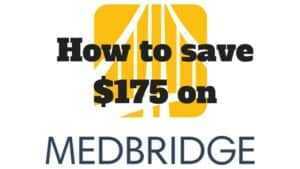 You can leave most travel companies unless your contract says otherwise at any time. Check your travel contract to confirm. It is usually best to switch travel companies after you have completed your current travel assignment due to payroll and overall professionalism. You are also not locked into staying the full time with your travel assignment usually. Many travel contracts are 13 weeks, which is short in itself. However, if an emergency happens and you need to end early- you are often able to as long as you give 2 weeks’ notice. You will often not be penalized financially and if you leave the facility on good terms-you will often not be penalized as well and the facility will be happy to have you back at a later date. However, it is important to not make a habit of ending your travel contracts prematurely. You need these facilities as your references, and this could impact your future positions as well as overall career. Make sure to read your contract for specific clauses for situations like these as well! Ready to become a travel therapist? You can start by speaking to 2 of my recommended travel recruiters who can help get you set up with first assignment! 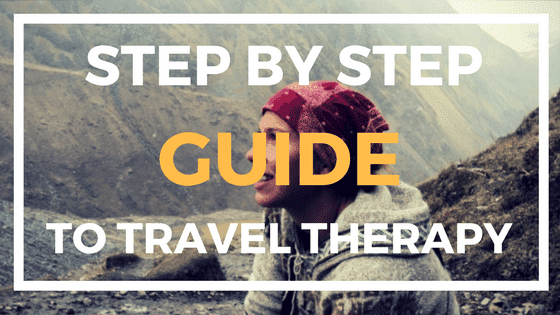 DONT FORGET TO JOIN THE FREE TRAVEL THERAPY 101 COMMUNITY! 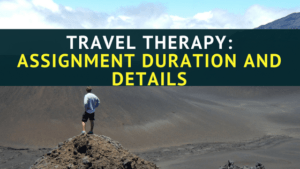 Join the Travel Therapy Mentorship Program! Get the Travel 101 Success Course, personalized help, and 3 vetted amazing recruiters to ensure your travel career is easy and successful! 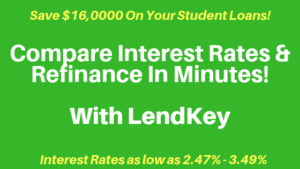 You will even learn how to pay off your student loans with my How To Pay Off Your Loans With Traveling Course!